Please Visit ADI MasterClass for the latest information and best pricing. Whether you are an experienced instructor, or a student preparing for ADI Part-Three, of your driving instructor examination, the SmartDriving Visual Teaching System (VTS) will enhance your in-car presentation and keep your lessons on track. Try our free sample diagrams with your customers. 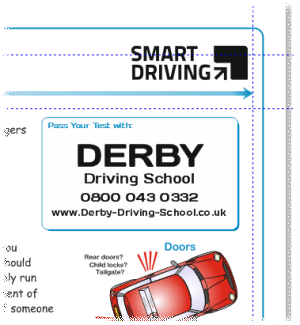 The SmartDriving Lesson Handouts are designed to help learner drivers to prepare for lessons and revise after lessons. The Handouts will enhance the professional image of any driving school helping to increase referral business through enhanced customer service. This item is now free on the new publications link. The DriverActive Pupil Record System from SmartDriving offers all the benefits of good pupil record pack with none of the usual problems. Unlike other systems and logbooks, Its easy to use, common sense format ensures maximum pupil progress by encouraging 'participative learning'. A range of driving and teaching titles specially chosen for Drivers and Driving Instructors. The SmartDriving Visual Teaching System - The Original VTS! 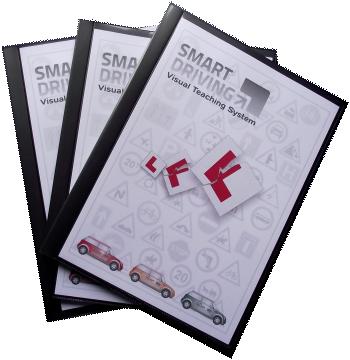 The SmartDriving Visual Teaching System has been an instructors' favourite for 12 years and now it is available in a brand new download format. In driver training it has been widely accepted for years that the use of visual aids can make life a lot easier for both the learner and instructor. 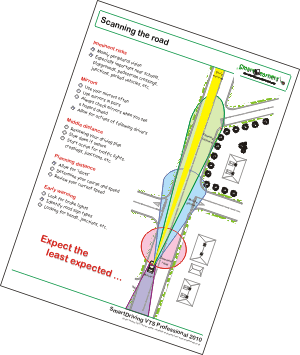 The SmartDriving Visual Teaching System (VTS) is a tried and tested set of diagrams that are ideal for Part-Three, Check-Test and day-to-day use. Whether you are an experienced Driving Instructor, or a student preparing for Part-Three, the Visual Teaching System will enhance your in-car presentation and is ideal for all countries that drive on the left. ADI students find that using the VTS makes briefings and explanations easy (using the 'SmartDriving Method'). The downloadable VTS is best presented in a durable, polypropylene presentation folder or similar for easy 'wipe clean' use with a dry marker pen. The simple, non-cluttered design enables you to illustrate an infinite number of points for your pupils. With a modern look and feel, the VTS will remain up to date for years. It's easy to see why it is rapidly becoming the favourite choice for UK ADI's and Part-Three candidates. Your download purchase fee is for a single user licence. Serial numbers and passwords are for your own personal use and may not be distributed or shared with anyone else. The pdf file containing the diagrams and any printed documents made from the file may only be reproduced, for your own personal use. Unauthorised sharing of serial numbers and/or passwords, or unauthorised reproduction of diagrams will result in prosecution and/or civil action for damages. Lost passwords require a £5 administration fee for retrieval. A picture paints a thousand words, or so the old saying goes. This is especially true when you are helping someone, for example a learner driver, to understand a new concept or idea. By using SmartDriving Learner's Handouts you will enhance your professional image. This can help to increase referral business and, in turn, move you towards a higher-than-average pricing structure. By using your SmartDriving Learner's Handouts during your Check-Test you will be demonstrating to your Examiner that you are committed to structured training and positive customer care. And to send their friends as well! 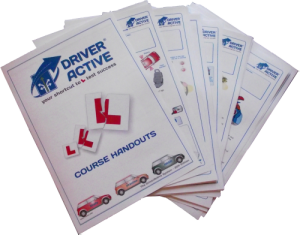 SmartDriving Members have special discounts for the DriverActive version of the handouts illustrated above (Gold Members get the colour version free, Standard Members get the black and white version free). The SmartDriving Handouts have all the same material but with SmartDriving branding. See below for free samples and personalisation options. To purchase your handouts simply select the version you require from the drop down list on the right and click the 'buy now' button. 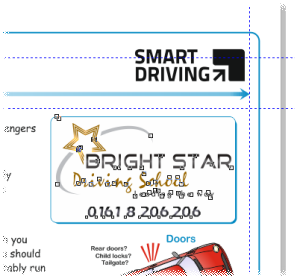 If you are purchasing the personalised version please send a separate e-mail to info@smartdriving.co.uk with a hi-resolution image file of your logo and/or the text you require for inclusion (see details below). Click here for more information about the benefits of SmartDriving Membership. 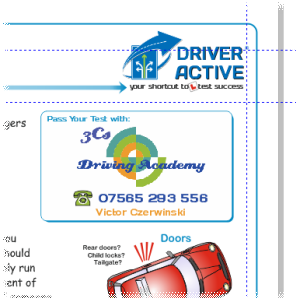 You can personalise your handouts with details of your driving school. This adds to the marketing value and gives your school a unique selling point - especially when your pupils show the handouts to their friends. Personalised handouts are standard price + £18. Note that colour personalisation is only available on colour handouts. Note: All handouts are latest edition - samples might show an earlier year. 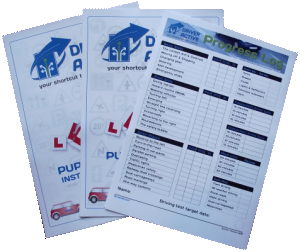 You can personalise your handouts with your logo or with text. We suggest that you always include your phone/text and web/email contact details. If you simply want text we will design a layout for you similar to that shown in the 'Derby' example below. If you wish to include a logo please supply an image file - this ideally needs to be hi-resolution for good reproduction results (note that files designed for web use are usually low resolution) - you can supply the image in any common graphics file format or as a pdf file. As competition and standards are getting tougher, it is more important than ever for driving instructors to 'add value' to their lessons. Training continuity, measurable progress and positive pupil motivation are key factors that determine your potential for referral business and increased profit! The DriverActive packs offer all the benefits of good pupil record system with none of the usual problems. Unlike other systems and logbooks, It's easy to use, common sense format ensures maximum pupil progress by encouraging 'participative learning' - the system offers a quick, easy and accurate way to track your pupils' progress. 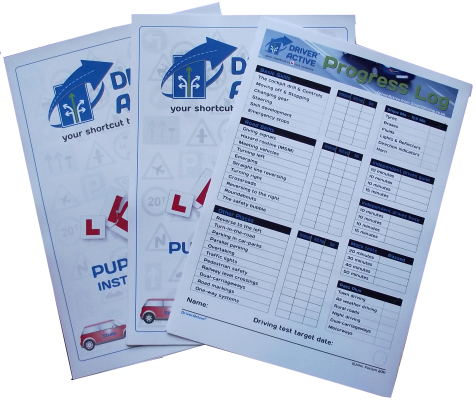 The DriverActive Pupil Record System is included with SmartDriving Membership but can be purchased independently - just £14.95 for the download master sheets. Your new pupil record master sheets come complete with the booklet 'Using your Records' covering how to use pupil records for better training and business success. The DriverActive Pupil Record System from SmartDriving will help ensure continuity of training. In turn, this will accelerate your learners' progress and motivation.